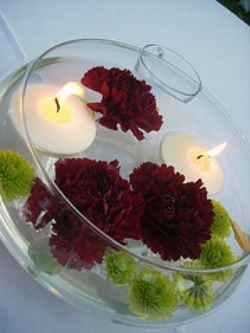 Brilliant, you are looking for cheap wedding table decoration ideas, you must be near the end of your planning stage!?! All these extras can soon add up and blow your budget, so help is here! All of the above I have in the past borrowed from venues I have planned weddings at. The items they have in house are easier as they already have them. Some venues will pay for your flower displays, colored linens and other items if you get them to agree at the initial meeting stage. If you don't want to ask directly you could ask by bringing up an item in conversation and asking if they can provide it, they may say yes but it will cost x. You can then say, oh that's a shame as the venue we saw yesterday was able to do that. If they think you may go somewhere else you are in a good place to negotiate. Good luck! Think about the time of your wedding reception, if it is in the evening then there is nothing better than candles, they add a romantic glow to the room - and the guests, everyone looks gorgeous in candle light. Ask if your venue has candelabras that you can borrow free of charge and buy candles to match your color scheme. Ivy round the base and confetti or rose petals on the tables and you are done. Lanterns are another great way to have candle light, and also if your venue doesn't allow candles you can now buy battery run tea lights! They even flicker! The best bit is that when they are in your lantern or tea light holder you would be hard pushed to know the difference. They are more expensive than normal tea lights but they last longer and are safer. If you already have your theme and colors for your wedding and you are searching for specific items it is worth delving into the wedding forums and auctions sites to look for brides selling off extras or even the ones they have used. Just think they will have only been used once and you could get a real bargain. Another great free, well almost free, cheap wedding table decoration is to look to nature - or to be more precise look to family and friends gardens - ivy and evergreen branches can help bulk out a table decoration. A trick that I love to use and is so easy is to get some children's pva glue - the stuff that is white and dries clear and paint it onto branches, leaves and even fruit, just on the edges is best and then dip into glitter. Leave to dry and you have a sparkly, frosty table decoration. The effect is brilliant and looks even more sparkly if you add candle light. You can also use egg white and sugar for a more subtle sparkle and this looks very pretty on fruit. As always it is worth having a look at the latest bargains available online, click on the link below for more information on wholesale wedding supply prices. One groom I know managed to buy all 12 goldfish bowls for less than he could rent them from the florist. 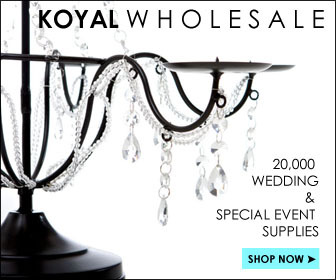 My favorite is Koyal Wholesale. 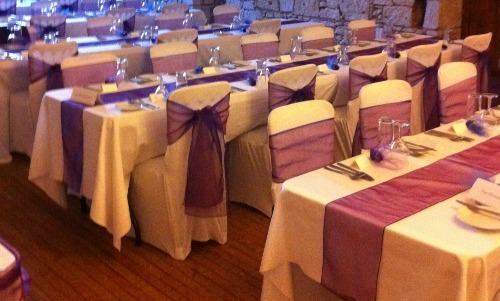 It is also worth remembering that your table linens will play a big part in the look of your tables. If your venue is providing the table linens they will often be in white, but if you want them in your own colors then it is quite possible they will be able to provide that too. Most venues will hire their linens so asking for a different color is not going to cost them much more than they would normally pay. Even if they ask if you cover the extra costs it will be a lot cheaper than you buying them or hiring them privately. Another option is to have a colored table runner or tulle to add a touch of color to your tables. Or you could add color by having colored napkins at each place setting. With colored tables you don't really need that much more in the way of decorations.